To achieve a faster, more costefficient work process for the expansion of the strategic road network, the Norwegian road authority created a separate organisation in 2015 known as Nye Veier (New Roads), with an investment budget of NOK 130 billion (EUR 13.5 billion). The first project that Nye Veier has procured is a 23 kilometre section of motorway with access roads on the E18 between Arendal and Tvedestrand. The new section, which will be opening to traffic in October 2019, is an important element of a long-term project to build a four-lane motorway all the way from Oslo to Stavanger, a section covering around 555 km. The main contractor for the project – which has a budget of just over NOK 3 billion (EUR 315 million) – is the contracting and industrial company the AF Group. For the surfacing work, the AF Group has in turn engaged NCC Industry. 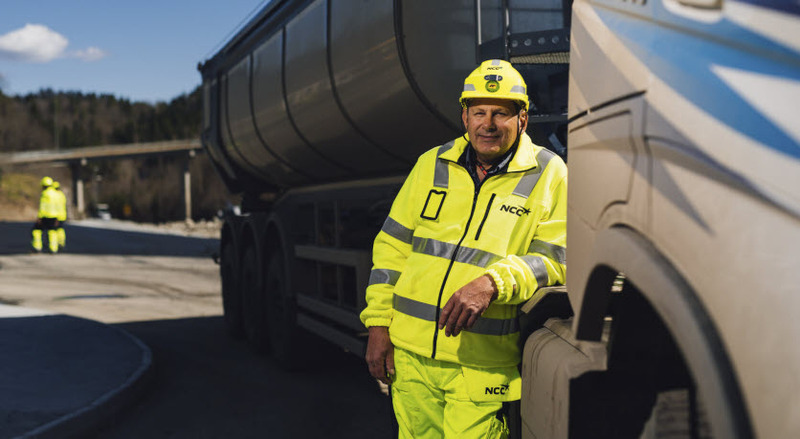 In other words, there are a number of challenges facing Sigve Andersen and his colleagues, not least in producing such high volumes of asphalt during a relatively short period. Another challenge is the logistics. It takes very precise planning to coordinate all the deliveries of aggregate and bitumen so that the right volume of asphalt is delivered to the workplace at the right time. Furthermore, some of the aggregate is arriving by boat, which is more difficult to plan than road transport operations. A third challenge is the environmental aspect. Nya Veier has specified strict requirements not only for environmental consideration, but also for health and safety. In view of the intensive schedule, NCC will have to lay around 2 000 tonnes of asphalt each day. “We’ll be using two pavers with full mechanical control to make sure that the asphalt is laid to a high level of precision and also applying a 9.5 metre width for the wearing course,” concludes Sigve Andersen. The asphalt will have a thickness of 200 mm, with a surface course of 45 mm. The base course (AG 22) will be needing around 175 000 tonnes of asphalt, while the binder course (AB 11) needs around 70 000 tonnes. The surface course (SKA 16) is produced using Nypol 82, a polymer-modified binder (PMB). The total volume of bitumen is 15 000 tonnes, of which 3 000 tonnes are polymer modified.